Association is staging this popular event in conjunction with Southend-on-Sea Borough Council. 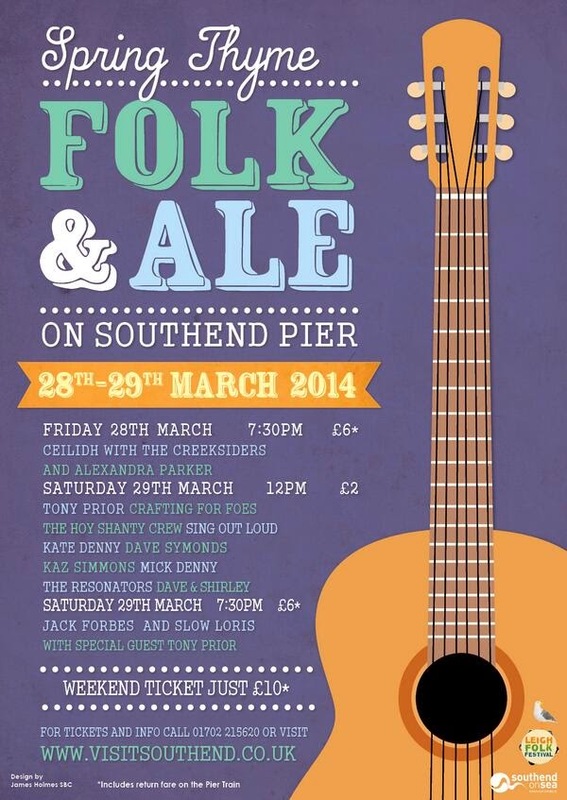 It all begins at 7.30 pm on Friday 28th March with a Ceilidh led by The Creeksiders and their caller Alexandra Parker. From noon on Saturday 29th March there will be an array of folk talent delivering six hours of spectacular entertainment, including Mick Denny, Sing Out Loud, Crafting for Foes, Hoy Polloi, Kaz Simmons, Dave Symonds, Tony Prior and others. Then from 7:30pm on Saturday evening there will be a special performance of Jack Forbes’ celebrated ‘Down the Hill to the Old Town’ a folk theatre show based on the tales and memories of a small fishing community living beside a creek in the Thames Estuary, the place today known as Leigh Old Town or Old Leigh. It is a dramatic monologue combining elements of storytelling with original music and songs, and providing opportunities for audience participation. The show is written by Jack Forbes, who also composes and performs most of the songs, with musical accompaniment from Slow Loris. Southend-on-Sea Borough Council’s Executive Councillor for Culture and Tourism, Councillor Derek Jarvis said: “The Royal Pavilion on Southend Pier is a fabulous venue for this terrific folk event featuring a wealth of talent and originality. It is also a really remarkable opportunity to see a folk musical about Leigh history and its people. For tickets please call 01702 215620 or please visit www.visitsouthend.co.uk. Olympic Torch Anthem - Concert on Southend Seafront. Southend’s world famous Pier is hosting a wealth of exciting attractions for all the family throughout the summer. at the Pier’s new Cultural Centre. Bring the family and walk or take the train to the end of the Pier to make a day of it. You can bring a picnic or eat in the new Cultural Centre Café. The Southend Pier Festival, a unique two-day musical extravaganza is on a weekend in August. This event will feature more than 50 bands who will perform at the Pier Head. Launching a music festival on Southend’s landmark Pier was the brainchild of Fi Jacobs & Dave Dulake of The Railway Hotel. Managed and financed by a small group of local music lovers, the festival showcases dozens of bands, musicians and artists playing Indie & blues, Rock, Garage, Folk & Americana. Southend-on-Sea Borough Council’s Executive Councillor for Culture and Tourism, Councillor Derek Jarvis, said: “Southend Pier is an internationally recognised and iconic attraction in its own right and we are delighted this year that it is also offering such a wide choice of different kinds of entertainment and activities.